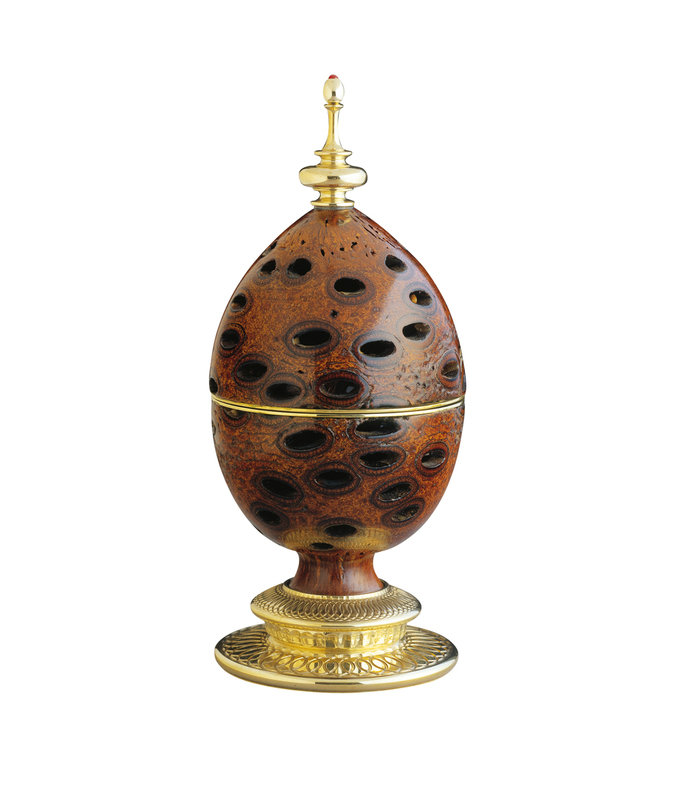 Theo Fabergé hand-turned the shell of a Banksia Nut, characterised by its fascinating natural piercing and rich colouring, to explore further his celebration of the senses. Lacquered and adorned with 24-carat gilded bezels, the Egg is surmounted by a finial set with a cabochon ruby. The foot is ornamentally turned on Theo's Holtzapffel lathe dating from 1861. On opening the egg, the surprise is revealed as a pierced and turned vinaigrette, containing and releasing the fragrance Special No. 127. Theo's only daughter Sarah selected this fragrance with J Floris of London who designed it in 1890 for the Russian Grand Duke Orloff. Materials: Banksia Nut, 24-carat bezels and cabochon ruby.